The Manning family home was built in 1824 by Robert Manning Sr., Hawthorne's uncle. Hawthorne visited this house and for a time lived next door at 31 Dearborn St. (now located at 26 Dearborn St.) in a house built for his mother by Robert Manning. Robert Manning, Sr., was a famous horticulturist who produced over 1,000 varieties of pears in his pomological garden. His son, Robert Manning, Jr., continued his father's work. 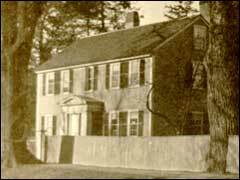 The last Manning resident of the house was Rebecca Manning, daughter of Robert Manning, Sr., and cousin of Nathaniel Hawthorne. Rebecca Manning died in August, 1933. The Resources/Images section for this subtopic features photographs of the house and garden, and the Resources/Multimedia section features short videoclips of the interior and the garden today. In addition, the Resources/Original Documents section offers a few related documents. Many of the photographs, videoclips, and articles are courtesy of Loretta and Roger Rainville, current residents of 33 Dearborn St. and David Gavenda, National Park Service, Salem Maritime National Historic Site. Mr. Gavenda knew Mary Cate, a friend of Rebecca Manning. Mr. and Mrs. Rainville and Mr. Gavenda narrate the audio and videoclips.